This is Par﻿t I of th﻿e ﻿collection of Pre-Calcul﻿us Po﻿we﻿rpoint Presentations﻿ I developed over my 19 years of teaching Pre-Calculus. It contains 47 PowerPoint Presentations! Why is SAT in the title? 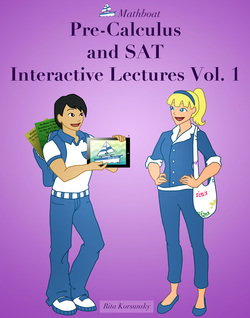 Because these lectures will help tremendously with SAT preparation. Solving MC problems from the SAT book only helps if students know the material really well, and the only thing they need to do is to practice. From my experiences, I know that students first need to learn the mat﻿erial well, and then start practicing from the prep book. "What is the best time to take the SAT?" "June, after we are done with the whole year of Pre-Calculus course." My students who follow my advice and take the SAT after they are done with Pre-Calculus course mostly get 800 on their SATs. Get a free sample interactive ibook for ipad! Also available: Kindle and Paperback versions of this book. The title of this book in both Kindle and Paperback formats is "Pre-Calculus and SAT Lecture Notes". The Kindle version is very convenient! You can download it on your mobile phone and it will travel with you everywhere you go! You can learn Pre-Calculus and prepare for your SAT Math Exam anytime and anywhere you want! Get a free sample of the Kindle version! The Paperback version is awesome too! You can take notes on this book, study from it, and use it as a test preparation tool for chapter tests, as well as for the SAT exam. Look inside the Paperback version! “From studious memorization techniques to funny, attention grabbing pictures, this book has it all. Through studying with this book, I learned through examples and proofs to know a lot of the concepts of PreCalculus. The memorization techniques helped me a lot on tests when the formula could have gone both ways: positive or negative. Basically, it's AWESOME!” – B.W. “This is an excellent book! It helps me review Pre-Calc concepts and has easy to understand lessons for new topics.” - N.Shah. “Pictures and concise, clear information make this book a great read for self-study and review of Pre-Calc lessons.”- H.D. “The transition from Pre-Calculus to Calculus BC was easy for me, thanks to Ms. Korsunsky's Pre-Calculus lectures. Concepts are explained very clearly, and several examples are provided that allow students to easily complete assignments. I highly recommend this book.” – M. K.
"Pictures and clear, concise information make this book a great resource for self-study and review of Pre-Calculus material. All the lessons and chapters are explained and organized well, making the information easy to understand. "- Nathan C.
"Very helpful if you want to take the SAT Subject Math level 1/2, or just need extra help in precalc. Style of writing makes concepts understandable and clear. Would recommend!" -Mei Hsiu C.